Ever since the food marathon that is called Foodbuzz Festival this past weekend, I have been craving a lot of fruits and vegetables. Well, more so than usual. I have been really busy since coming back from the trip, catching up on work and study. I still don’t feel like I’m caught up with my work or study, but at least my eating schedule is back to normal now. I’ve been listening to my cravings. I’ve been drinking teas non-stop. 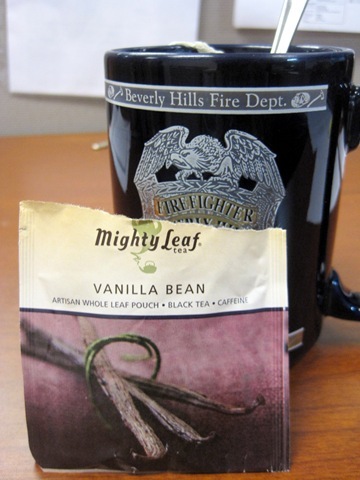 These pictures are from work (no, I don’t work for Beverly Hills Fire Dept, it’s just a cup). 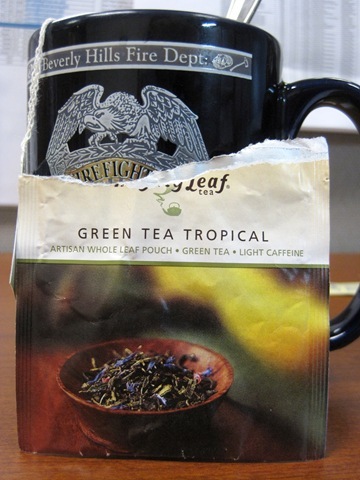 I drink teas throughout the day. The weather has been chilly and windy so I’ve had miso soup everyday since Monday. 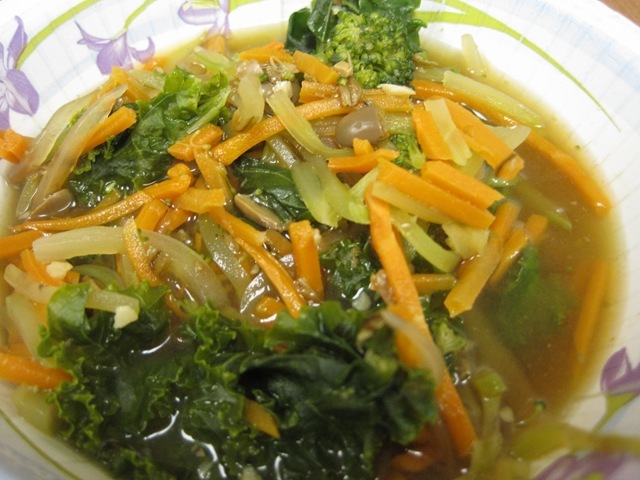 I put kale, broccoli slaw, onions, celery, juice of fresh minced ginger and dark miso in the soup. I’ve been eating huge salads with leftovers. I love Frog Hollow Farms pears that I got from my gift bag this weekend. 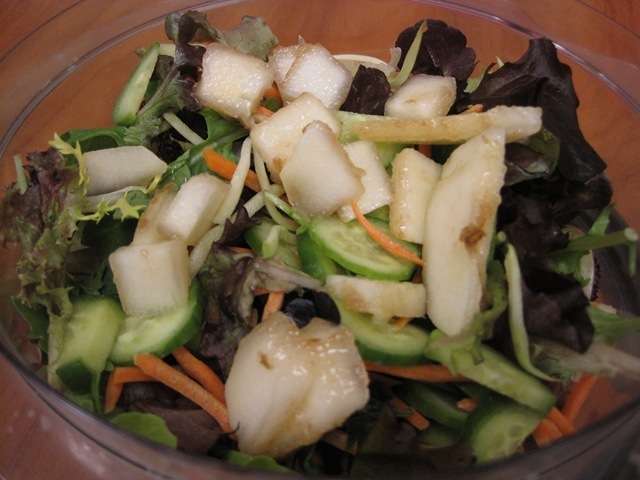 Eating pears are not usually memorable for me, but these pears are really good. 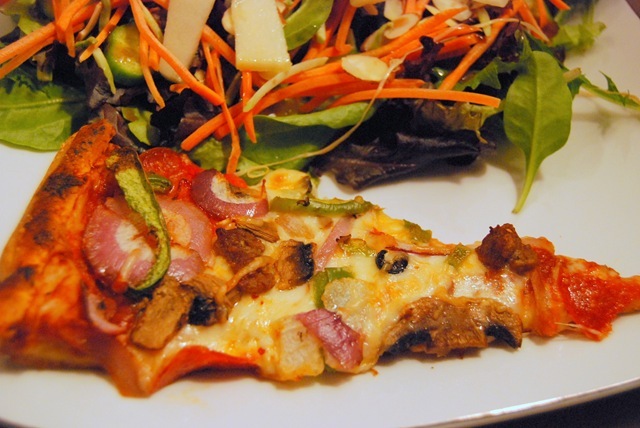 Salad with a side of pizza. 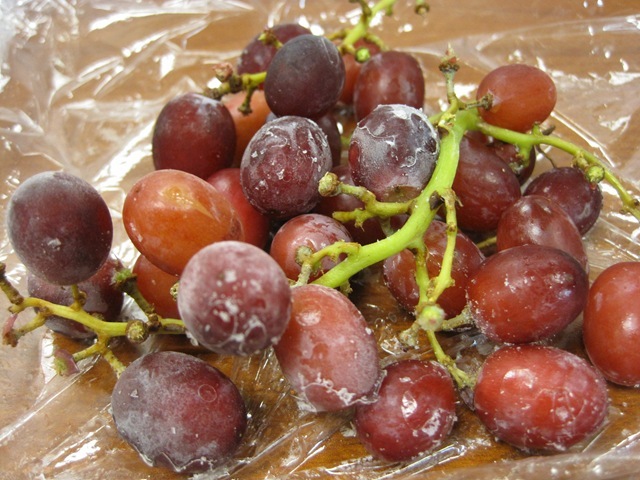 Frozen grapes have been my snack of choice in the afternoon. These are so sweet and cold, I eat them with my heater on under my desk. Is it me or do they taste sweeter when frozen? 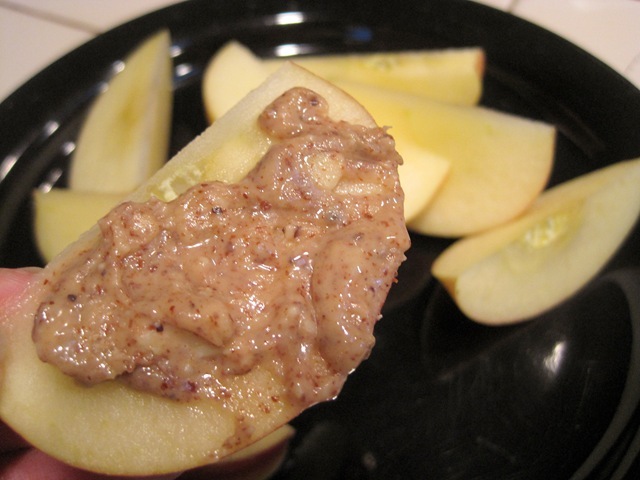 My early morning runs have been fueled with sliced apples + almond butter. Pre-run fuel. 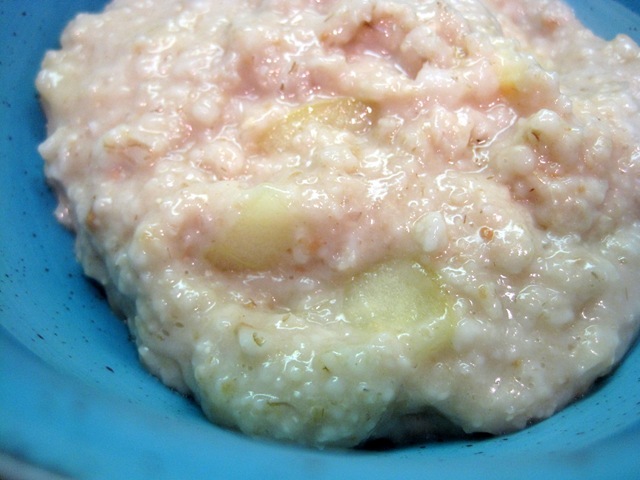 After-run breakfast is cooked apple mix with oatmeal. 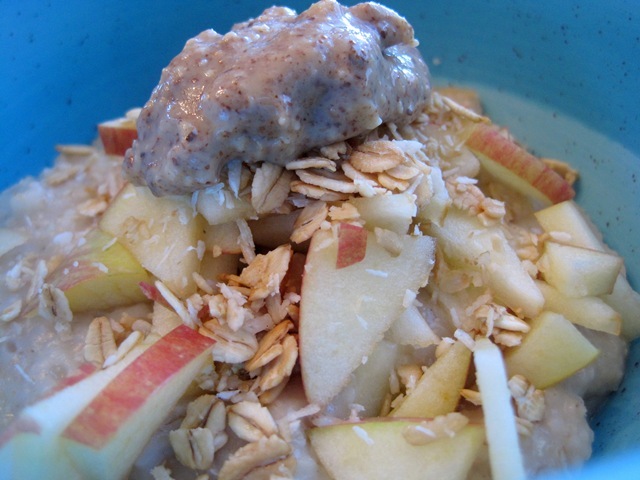 Topped with more apples, a little granola and almond butter. My packed lunch has been a repeat of the combination of the foods above. Sabrina gave me a cute bag when we met this weekend. I love the red color and design. 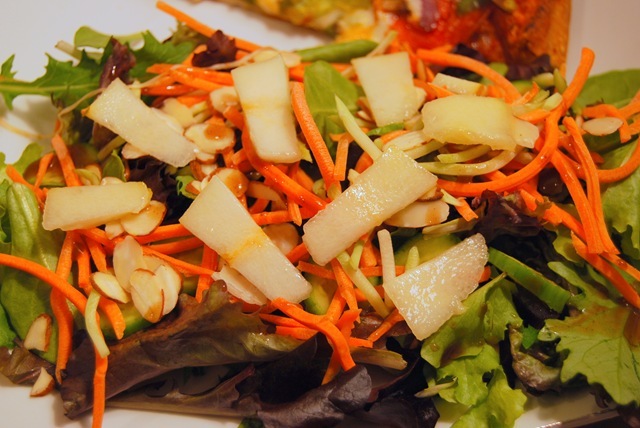 This week has been all about veggies and fruits. I have had no cravings for sugar, which is expected since I probably overdosed in sugar from all the cupcakes, cookie dough and french toast tastings. 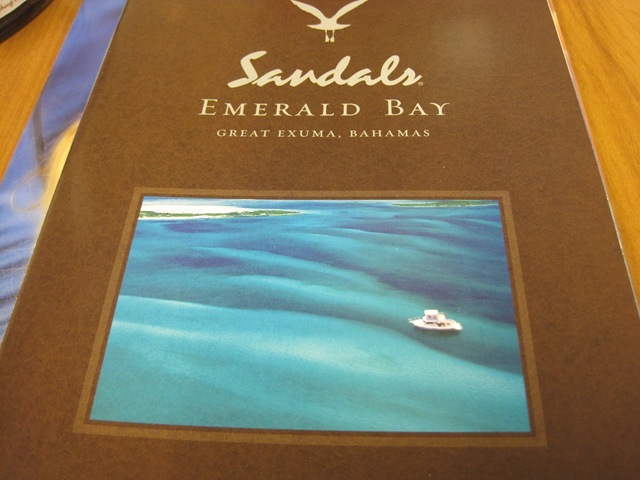 My fun reading materials this week has been Sandals Resorts brochures. The fiance and I have not decided what we are going to do for our honeymoon. We have a few options for our honeymoon. The hotel we are staying in for our wedding is a great hotel, so we can extend our stay at the resort after our guests leaves. Our friends and family are leaving the day after the wedding. Another option is to move hotels, somewhere in Mexico to a more private secluded location. With a different location, we’ll feel rejuvenated and we’ll have an actual honeymoon and not just an extended stay from our wedding. Or we would go home first after our wedding, then leave a few days after to go to Europe, Caribbean or Hawaii for our honeymoon. Aww…sweet post. And no..you are not alone: I think grapes are sweeter when frozen, too! Have fun deciding on a honeymoon spot. What a fun time in your life!! Thank you Kelly. Planning the wedding and honeymoon has been fun and I always keep in mind to enjoy and appreciate every detail and moment in the planning. Fruits and veggies always make me feel a million times better. And frozen grapes are SUPER sweet- almost like candy- love them. On the honeymoon front- like I told you, we stayed at Secrets in Mexico and it was awesome!! Ahhh frozen grapes are like my most favorite snack ever! YUM! 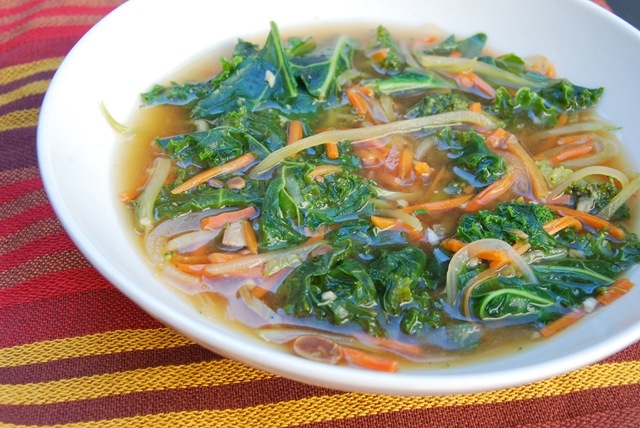 that soup sounds amazing – flavorful and healthy! My sister had a destination wedding in Vegas and then a honeymoon in Mexico. I think it’s a good idea to head somewhere different for the honey moon to make it really feel special. I’d recommend not leaving the day right after the wedding though. Give yourself some time to recuperate. we went to a couples jamaica resort. it was nice, not the most luxurious in the world, but jamaica is super affordable. we were able to stay at our resort for 12 days instead of 6 or 7. good luck choosing! Selecting a honeymoon location? How fun! I vote for somewhere tropical and secluded. 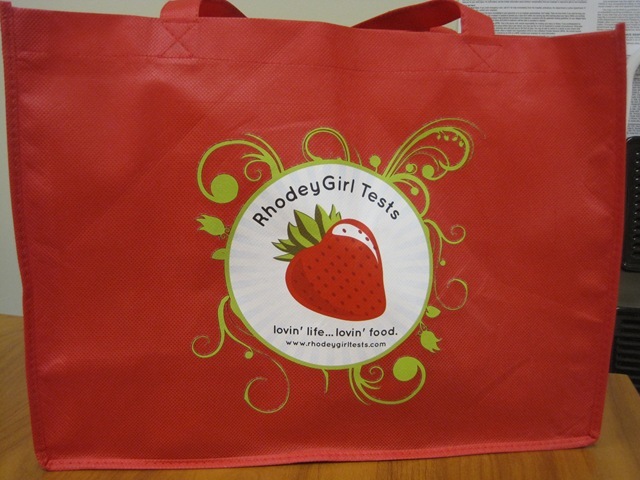 Just reading this post is making me crave fruits and veggies! I also think grapes taste sweeter frozen haha. I love them frozen! Have fun planning for your honeymoon! Love the idea of heading home and then going to Europe. May I suggest Italy because it’s beyond fabulous? Yum, nori sheets in that soup!!! I never though to do that before, what a great idea! 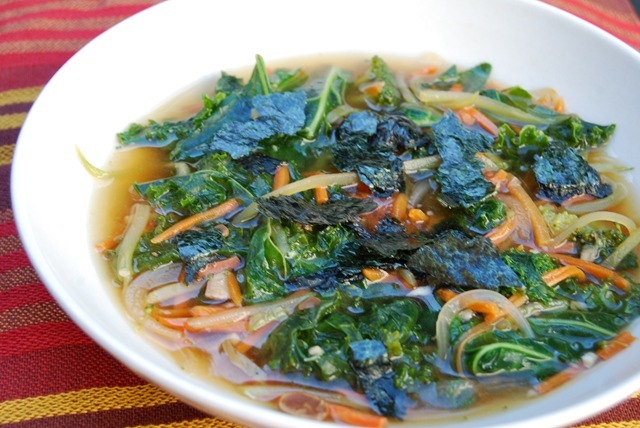 It’s kinda like a seaweed soup in a way, but with lots of other goodies!! I LOVE frozen grapes in the summertime!!! I say live it up, you only get one honeymoon!!!! Yes, i needed a detox too! But I can’t wait for next year and I’m so glad I went. How exciting about the honeymoon! I ‘ve been to europe so many times so I would choose something different. But have you visited much of europe? If not, I for sure think europe! And hopefully, you only get one honeymoon! Neither me and fiance have been to Europe and I really want to go there (more so than him). He loves being in the water and prefers tropical locations that have beaches. Are there any good beaches in Europe? Or at least a place where the water is warm and we can enjoy a few days by the water? 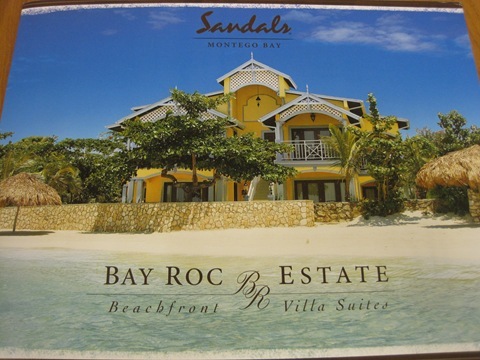 I actually looked at Punta Cana hotels when I was deciding where to get married. Thanks for reminding me that location, it’s beautiful. Lea are you getting married in the Bahamas!? that’s awesome! I think destination weddings are the way to go. It will be beautiful. I was going to suggest Fiji but that’s sooo far from the Bahamas. Hi Roxan, I’m getting married in Puerto Vallarta but the brochures for the honeymoon locations ahd a lot of Bahamas locations. We are considering Fiji, it’s just a matter of which location will fit in our budget. Fiji and Europe are pricey but I know it will be an amazing trip if we decide to go there. I think I’d stay put rather than packing up again and changing locations. That could be a hassle. You’ll want to just relax after the wedding. 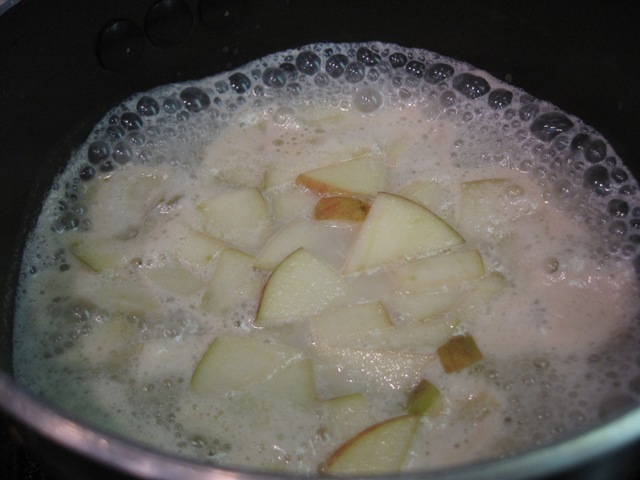 You know, I never think to use miso soup to create another type of soup. frozen grapes are so great. i should’ve hit the farmer’s market today and gotten more to freeze! Lynn, where did you go for your honeymoon? 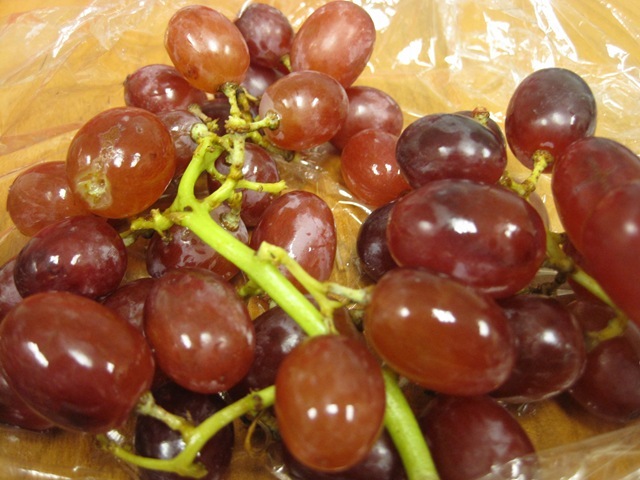 Ooo… I do like cold grapes but frozen hurts my teeth (got sensitive chops). Looking forward to reading about your wedding adventures! Liz, thanks 🙂 Oh yeah, I understand about sensitive teeth, mine are not that bad though. If you are interested, I have a separate wedding page that has all my wedding related posts.